hackers.mu has been selective when it comes to choosing members. Some folks didn't like the way we do things. It is just difficult to move in any directions if we don't have enough like minded folks on board. But here we are, some years after, we are still working like ninja's to keep you safe and sound on the Internet. We may not share free goodies, stickers, labels etc to look like cool hackers, But, you can always find our patches (code fixes) that we contribute, online. Those patches are built for software that you are most probably using. It has been a very productive year and we have achieved so much in such short time. Hence I decided to make a small write ups of some major Milestones we had set initially. Among other of these operations, we have been present at different conferences around the island to share a bit of what we do. e.g we are usually present during the devcon, sometimes on the UoM campus, WebCup Licensing. There are more dangers laying ahead, and we are actively always working towards ensuring a secure e-environment for your all :) . Right now, we have Darren who is out in Nairobi for an AIS hackathon. Recently we were even on MBC tv to educate people on this whole WannaCry panic that was happening a bit all around the world recently! 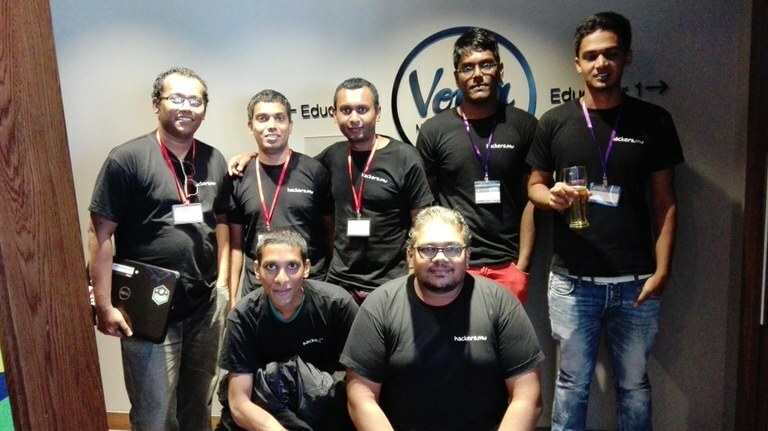 :) We are not only putting Mauritius on the world map, but we are also actively working in pushing the levels of developers higher and higher in the local community. I wish to extend a warm thanks to all the hackers.mu members for keeping the passion burning. Final note, it has been quite fun running hackers.mu alongside Loganaden Velvindron and the current Core team.